One child has swim practice. Another child needs to be dropped off at soccer. Both children have to be picked up from their extra-curricular activities within 10 minutes of each other, and everyone needs to eat dinner before you can take the kids to their karate lesson at 6 p.m. If this scenario sounds familiar to you—or if it makes you break out into a cold sweat—trust me, I get it. The chaos is real. I currently have two sons who are constantly on-the-go with youth soccer, hockey and baseball, and a husband who is on the road for most of the week, so it’s up to me to manage every aspect of our busy sports schedule. As most moms know, juggling a full slate of practices, games and events—on top of managing work, school, household chores and everyday life—is no easy feat. However, with a little planning and a little communication, it is possible to stay on top of your young athlete’s demanding schedule. I can’t promise that the train won’t go off the rails from time to time (I speak from experience! ), but at the very least, you’ll stay on track a bit longer. Here are my top six tips to surviving the extra-curricular sports scramble. Since we rely heavily on our phones for communication, my favorite app to mange my family’s sports schedule is TeamSnap. This app has been a game changer for me because it completely organizes all of my kids’ sports in one app and conveniently syncs them with my calendar and maps. It also allows for seamless communication with coaches and parents. Plus, I never have to worry again about being that mom who shows up at the wrong field. Ughhh…meal planning can be such a drag, especially because it seems like we are always in the car driving from one activity to another. However, I honestly have found that creating a meal plan simplifies life, makes grocery shopping a breeze, and ensures that your kids are getting the fuel they need to stay active. I start by determining meal times in advance because this prevents our family from being caught off guard. For instance, on Mondays, we know we have to eat early around 4:30 p.m. because we have activities between 5:30 and 8 p.m. But on Thursdays, we can eat a bit later since our activities end by 5:30 p.m.
Then, I typically plan a month’s worth of meals so that there’s consistency. For example, this month we have salmon and sweet potatoes on Mondays, turkey tacos on Tuesday, stir-fry on Wednesday, and so on. As a bonus, if you make a little extra food, it can go in school lunches the next day. I need visuals, so I have a weekly magnetic white board calendar that I put on my fridge with the time and meal we are having each day. On top of that, I also keep snacks on hand at all times—like pre-cut fruit and veggies in small containers—so I can grab anything out of the fridge or pantry in a pinch for on-the-go-nutrition. Coordinating game schedules, pickups, drop-offs and practices can be overwhelming, especially if you’ve got multiple activities for your kids and you’re the point person for all of the above. Reach out to other parents and caregivers to arrange carpools, pick-ups and drop-offs. Chances are, they’re in the same boat as you are. It really can take the pressure off if you can find one or two friends that you can share carpooling duties with. It sounds so simple but it’s so easily overlooked when you’re rushing from one game to the next. I make sure to check in with my boys to make sure they are aware of their activities each day. Right now, they’re both really big on getting some down time after school to regroup and have a snack, so I pay close attention not to over-schedule them or have play dates on days that they have early practices or games. I also keep them in the loop by showing them their activities each day on our family calendar. This way, there are no surprises when it comes to their weekly commitments. We’re all aware of the upfront costs of having our kids play organized sports, but I find that it’s the extra costs, like team travel and out-of-town tournaments, that are making youth sports increasingly expensive. I love team fundraising because it’s an effective way to defray some of these additional costs —and you really get to know other families in the team. Bake sales, car washes, raffles, candy drives and pub nights are just some examples of ways you can fundraise with your team and help keep costs down…and great team bonding. Every little bit can really make a big difference. 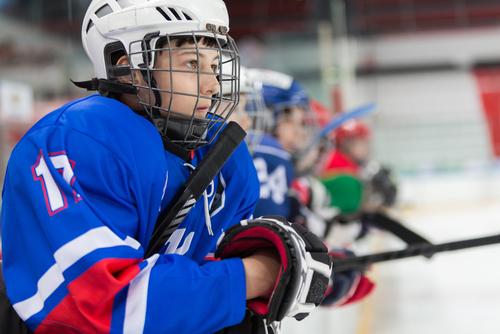 This one seems pretty obvious, but with youth sports becoming more and more competitive across all levels, it’s easy to lose sight of what’s really important when your kids hit the ice or step on to the pitch. Be mindful of creating a competitive environment for the kids that is positive, empowering, inclusive and, above all else, fun. Sometimes we get frustrated when games aren’t played out the way we think they should be. When that happens, take a step back and remind yourself that they are just kids and not mini professionals. They should not feel pressure to please us. After all, it’s about their own experience and fun—and not about our agenda for their future. So sit back and enjoy it, because it goes fast. Cammi Granato is a retired hockey player, an Olympic gold medalist, and was one of the first women inducted into the Hockey Hall of Fame in 2010. She also knows firsthand how demanding a jam-packed sports schedule can be on a family. As a busy sports mom, Cammi currently has two sons heavily involved in youth sports and is responsible for managing all aspects of her family’s sports schedule – along with her own career in holistic nutrition.